Fun post now and a proper one later (have an announcement of some great new content!). Was relaxing, having a beer and playing Rush PLO (just the small stakes one) last night when I actually folded quad-aces... yep, on purpose, after considering all of the other options. Not often you can say you did that! A little explaination of what was on my mind when I made the fold... Well, firstly I was out of position... position is very important in Omaha, especially when deep stacked (190 blinds deep at the time). 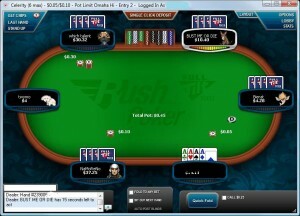 Secondly, people do not fold and love to call barrels in PLO Rush, in fact not calling off their river bets when the obvious draw hits saves me money over time (sure, they are bluffing sometimes, then again there are so many level 1 thinkers that this is rare....) The third and most important reason for making the fold... well, the screenshot below shows you - the aces were all in my hand!